As the fiery red July sun sank low on the horizon, finally disappearing behind Mitchell’s barn, the first bats of the summer evening swooped low, along the maple trees in our yard. Their small, dark shadowy figures glided effortlessly along the lowest branches, and dotted the skies over the clothesline at the side of the old house. The little brown bats returned to our yard every spring, and mothers produced just one baby each year, around the middle of June. By the end of July the babies took their first flights as they were weaned off of their mother, and began to eat insects. 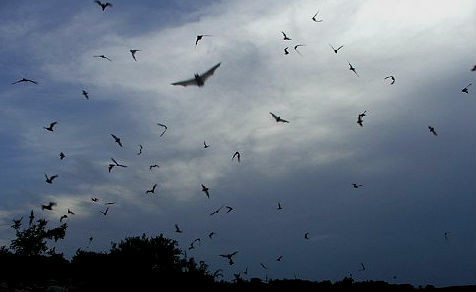 Although some were afraid that the bats would fly into their hair, they made a high frequency sound that bounced back, and prevented them from colliding with anything – other than the mosquitoes they feasted on nightly. Because they were nocturnal creatures, we never saw them in the daytime as they hung upside down, under the eaves of the roof, or sought shelter in the attic, above the kitchen. Around sunset each evening, they begin to soar around the yard, swooping and gliding along the branches, seeking out the bloated mosquitoes that dined on us, as we sat outside in the evening. Mother and Dad didn’t mind sharing our yard with the bats, and they sat in their lawn chairs, sharing a plate of oatmeal cookies; Dad with a coffee in hand, and Mother with her lemonade. The days were hot, often humid, and the only form of air conditioning in the old house was to open a window, and hope for the best. Sitting outside under the big maple trees in the evening was a nice way to cool down and reflect on the events of the day. We’d glance down the lane, watch the cars going by on the Third Line, and one at a time, turn on their headlights for the night. The crickets and bullfrogs were in full chorus by then, as more and more bats appeared, and the sky became a dark cloak, shrouding their movements in secrecy. Small flashes of light moved along the front garden, as the fireflies began their nightly parade, competing with the bats for our attention. As the summer season unfolded, there would be many nights like this. We’d sit outside to cool down after a long hot day, and we became the audience for the sunset performance of the small brown bats, and their aerial show. Mother and Dad would eventually rise from their lawn chairs, and fold them up for the evening; carrying their empty cups, and the scattered crumbs remaining on the cookie plate. The bats would continue their hunt for food long after we’d gone into the old house, gliding and darting in the yard, as we slumbered peacefully through the warm summer night.